As the Founder Of The Shorkie Club Of America My Goal is to make a clear distinction for potential shorkie owners between just a shorkie breeder and ethical dedicated shorkie breeder. In a nut shell, we have done all we can to take the risks out of adopting a new shorkie puppy. This is the only Shorkie group dedicated to the ethical development and establishment of this mixed breed. If you see any of this information on any other sites it has been taken from us. The Shorkie Club of America. I will give serious and equal consideration to construction, temperament, health and soundness, in the choice of breeding adults and will provide all genetic testing required. No female shall be mated without due consideration and genetic testing done on both sire and dam. I shall not breed a litter unless I am certain of finding good homes for the shorkie puppies. I shall never allow any puppy to leave my premises to go to a new home before the age of 9 weeks. I will supply a full and accurate shorkie puppy care statement outlining health care information, heartworm control, flea control, reasons for desexing (spay or neuter) ,etc. I will provide a written 5 year health guarantee for every shorkie pup I breed and adopt out . I will provide ongoing support and advice for the life of the shorkie pup. I will never knowingly adopt out any Shorkie puppy/adult dog to laboratories, pet shops or dealers in dogs or to person's known to do any of the above. I shall not provide any stud services to such persons (a dealer is defined as any person who regularly buys and resells dogs for sale at a profit). I will screen prospective Shorkie parents for suitability and shall fully advise them of the characteristics of the Shorkie as a breed stressing the necessity for care, grooming and ample exercise. I will never allow a shorkie puppy or adult which has any apparent physical defects or which shows definite departure from the Shorkie Breed Standard to be knowingly adopted out without the shorkie puppy parent attention to the rearing of the Shorkie puppies and to the well being of the dam. being made aware of such defects and its possible consequences. I will only adopt put Shorkie puppies and adults, which, to the best of my knowledge and belief are in good health at the time of sale. I will impress on the Shorkie puppy parent that they should contact me in the event of any problem arising with the Shorkie puppy or adult and that I will make every effort to be of assistance in these circumstances. In the case of a Shorkie is ever needing to be re-homed I will take full responsibility to assist as much as possible in achieving this end and will accept the return of that dog at any age if this in any way possible. I will be co-operative in any measures aimed at eradicating hereditary diseases or genetic defects. I will seek information and understanding of genetic diseases and defects and use this understanding in my breeding program. I commit myself to a positive breeding program aimed at eradicating such hereditary diseases or defects known or suspected within my shorkie breed by doing the required genetic testing. I will be honest and forthright in notifying any genetic or heritable diseases found to be in any dogs I have bred and pass on any information required to help Shorkie breeders make necessary choices in their breeding program. Any dog in my care shall receive immediate professional attention should it become ill. I will continue to offer helpful assistance to any puppy/adult Shorkie owner as long as such assistance is required. All dogs in my care will live in my home as a part of my family as well as the Shorkie puppies I produce. My home will clean and comfortable for my dogs and Shorkie puppies. I will provide adequate exercise for the my dogs and Shorkie puppies with appropriate stimulation and companionship each and every day. I will lead by example and advocate responsible dog and Shorkie puppy ownership. I will exhibit and promote excellence in the discipline and practice of Shorkie breeding. I will encourage the exchange of knowledge, of technical, practical and ethical matters between members. I will uphold the dignity of Shorkie breeding and the status of members of the SCA . This will be reflected by the knowledge and understanding, skills and positive attitude toward the members of the SCA. I will uphold and maintain the integrity of the SCA through impartiality and confidentiality. I will act and advise in accordance and within the parameters of my experience. This is the only Shorkie group dedicated to the ethical development and establishment of this mixed breed. If you see any of this information on any other sites it has been taken from us. Please check to see if it is a breeder we work with. 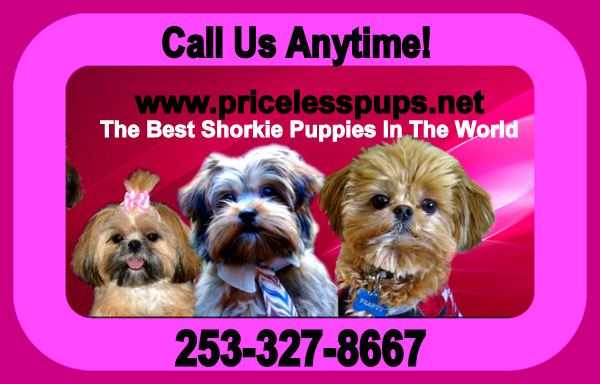 We are group of breeders that have joined together for the betterment of the Shorkie Mixed Breed. You will read below what our belief systems are in raising shorkie puppies and why genetic testing is so important to us. WE HAVE NOT ACCEPTED MANY BREEDERS as they have not completed the genetic testing on their adults that is required to join the Shorkie Club of America. Our group has been solely formed to gather information on the adults we breed and to keep record of their health and lineage. We also will be able to ensure no puppy we keep for second generation ever has the chance of being inbred or line bred as some refer to it as. The Hybrid Vigor in a mixed breed dog is a THEORY on a FACT. We believe in our breeding practices that we need to perform genetic testing to ensure to the best of our ability we are producing happy, healthy shorkie puppies. Shih-Tzu & Yorkshire Terrier. The Shorkie is the ultimate companion dog, a breeding that was created for families that have children and want to share their lives with a special fur baby. The Mother is always the SHIH TZU and the DAD is always the Yorkie. The reverse breeding is not considered or recognized as a Shorkie by our association. This reverse breeding does not produce puppies that fit ‘our idea’ of what a Shorkie should look like.We do have some second generation breedings as well that we have carefully planned. After years of experience we developed the only standard to date that exists for this mixed breed. The Shorkie Club of America is the only Shorkie group dedicated to the ethical development and establishment of this mixed breed. This club is very strict and limited to breeders it approves, to ensure that the Shorkie is bred for health, life longevity, physical soundness, and of course, temperament. We do not support or work with any breeders that do not stand behind their puppies’ health for a minimum of 5 yrs. Anything less than a 5 yr health warranty should serve as a red-flag to any potential puppy parent. The happiness of the dog, puppies and families that adopt these Shorkies are of the utmost importance to us. We have been breeding Shorkies puppies for almost 17yrs, and we pride ourselves on providing our families with quality, healthy puppies and personal service. We believe that all children need a companion, and a puppy will provide a friendship that will be uncontestable. Our Shorkie puppies have a wonderful temperament, and the desired coat texture (soft, fluffy, and easy to groom). This coat texture is beneficial for children and families who suffer from allergies as well. We use the formative weeks of the puppy’s life to develop resourcefulness, warmth and intelligence. We give them the best start, so our families will receive a puppy that will be exceptional. We are present at the births of our puppies. We can’t wait for the puppies’ eyes to open. We pick up each puppy and let him or her look at us, and we talk to him or her and cuddle with him or her. We are always very gentle with our babies. We do not cage our babies. They are born in our home. We supply them with hands on love from day one. We also leave a radio or TV on, so they are exposed to a variety of sounds. When they are about 5 or 6 weeks old, we let them begin to wander around our home supervised to begin exploring their surroundings. They get accustomed to trying to find us and locate us in our big family room and come to us and the sound of our voices. The mom decides when it is time to wean her puppies. Though, we introduce them to a very soft food at 3 to 4 weeks old. The mom may wean them at 5 to 7 weeks of age, but that does not mean that they are ready to leave her, or their littermates. They still have a lot to learn and they have to learn a lot of it by their canine family. Conventional breeders typically sell their puppies from 5-6 weeks of age; we do not let our families adopt their new puppy until at least 8 to 12 weeks of age. Puppies of any age that are not comfortable in human company are not ready to leave their mom and siblings. When a puppy prefers human company over its canine family, this is when they are ready to go. If we send babies before they are ready, we risk having a depressed, sick puppy. Taking the pup away before it is ready can have a long lasting emotional effect, and it can manifest in behavioral and temperament problems later. When a family gets their puppy from a breeder who has really loved the puppy, spent time with the puppy and raised it in a natural environment, the family will have a greater advantage, in the long run, of raising a dog that will be emotionally stable and easier to train. We believe that if a family gets their puppy from a kennel that keeps their puppies in cages all or most of the time, that family and their puppy may suffer for it, emotionally and physically. A puppy that is comfortable to leave their mother, will adjust more quickly to the new home, and statistically have fewer behavior and health problems. We believe that it is our obligation to provide the Shorkie puppies and the families whom we serve with the best possible start through good breeding, rearing, daily interaction, training through proper play and cuddling. Also, getting to know each of the families’ particular needs assists us in proper puppy testing and placement. We do provide a Puppy Aptitude Test to each of our puppies at 6 & 8 weeks of age. We think that adopting a puppy is an important process and should begin with the breeder. But the family adopting the puppy will also have to take responsibility. They have to be very honest with us, so we can suggest a puppy that will best fit into their family. Then, that family will need to educate themselves, hopefully, through this website and books. In our opinion, the most crucial time for human-puppy bonding is between 2 weeks and 3 months. To properly socialize a puppy, it needs to be introduced to different sounds, sights, and pre-spoiled with hands on love. myself, and who are breeding these dogs to ensure that the Shorkie is bred for( IN THIS ORDER) health, life longevity, physical soundness, and just as important, temperament. Any breeder that has qualified will receive our signature logo to place on their site.